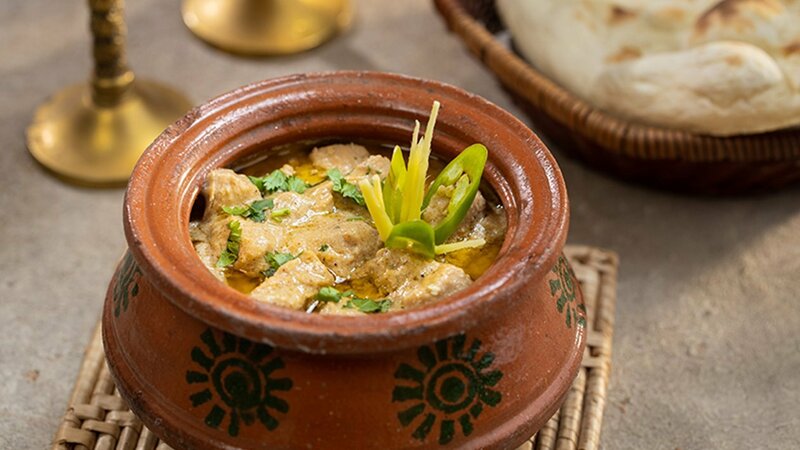 This delightful recipe of Chicken Malai Handi originated from Mughlai cuisine. We take the flavor to the next level with Knorr Chicken Cubes and Bestfood Classic Mayonnaise, to achieve a velvety texture that is much more delicious. Depending on how you choose to serve, it will work both in a buffet and a set menu. Grind together very finely sesame seeds, poppy seeds and cashew nuts, mix with yogurt, salt, white pepper, black pepper, ginger garlic and cream. Pour the marinade over the chicken and leave for 2 hours. Heat butter and 50 ml of Rafhan Corn Oil in a handi. Add marinated chicken and Knorr Chicken Stock Cubes leave it on low flame for 20 minutes or until chicken is cooked. Finally add cream and Best Foods Classic Mayonnaise. Garnish with coriander leaves and green chilies.